We’re halfway through October and Halloween mania has kicked into high gear. Haunted houses are popping up everywhere, children’s costumes are being ripped off of store shelves and all around the country in neighborhoods just like yours, BOOing season has officially commenced. You’ve most likely already seen the signs – cartoon ghosts proclaiming “We’ve Been BOOed!” plastered on front doors, whispered conversations among your co-workers, and spontaneous trips to the craft store when you know full well that your spouse doesn’t need any more glitter. So what’s behind this crazy phenomenon that has your neighbors all in a tizzy? You see, BOOing – also known as “Ghosting” or “Boo Bagging” – is a relatively new fad that’s become immensely popular in American suburbia. 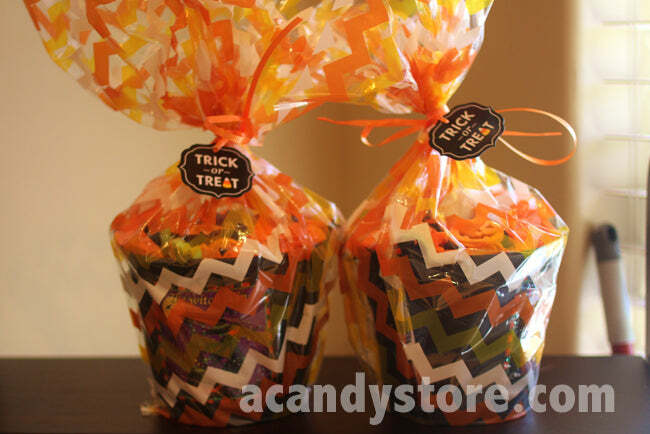 It starts when one instigator puts together one or several Halloween gift bags full of candy, art supplies and other Martha Stewart-esque goodies and leaves them anonymously on their neighbors’ doorsteps in the middle of the night. Attached to each gift basket is a standardized printout that explains the rules of the game. When the neighbors find the gift basket greeting them in the morning and discover that they’ve been BOOed, they are given two tasks in accordance to the printout. First, the BOOee is instructed to detach that “We’ve Been BOOed” sign and post it on their door as a sign that their house has already been “hit.” This prevents the other BOOers in the neighborhood from accidentally doubling up on any one house. 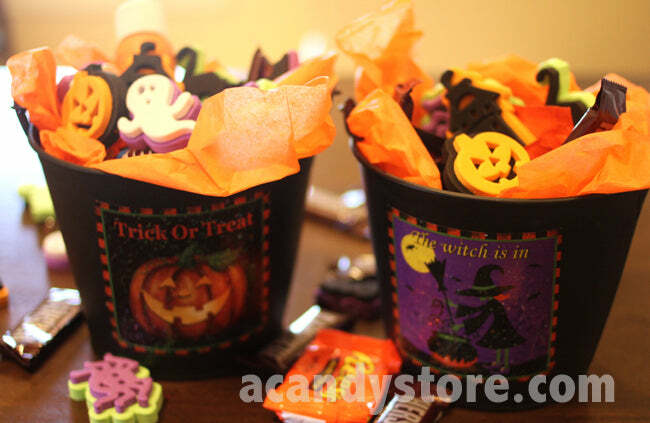 Second, the BOOee is informed that they now have 48 hours to return the favor by BOOing two or more houses with gift bags of their own creation – thus completing the cycle and ensuring the viral spread of clever and delicious Halloween gift baskets throughout the neighborhood. 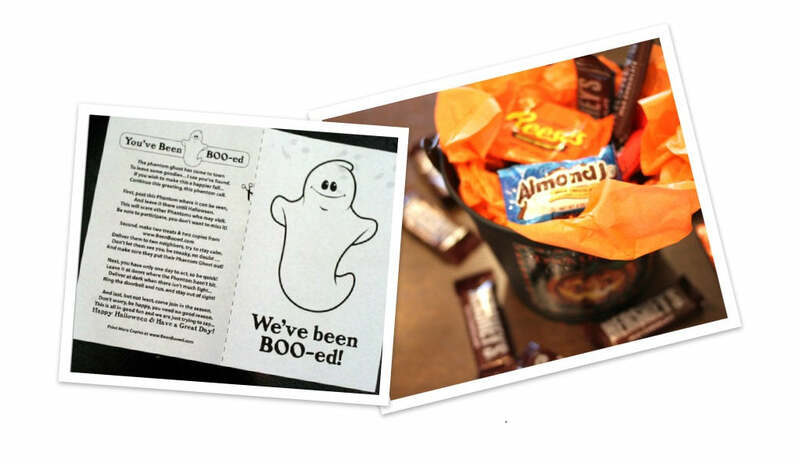 So in a sense, BOOing is a lot like spreading a chain letter, only this time the chain letter is full of chocolate and stamps and looks like something Martha Stewart whipped up in her craft room. It’s an easy and fun way to do something nice for your neighbors, and if your street or office isn’t doing it already, we highly recommend giving it a try. So let’s say you’ve just been BOOed or are interested in starting a BOOing chain in your neighborhood. 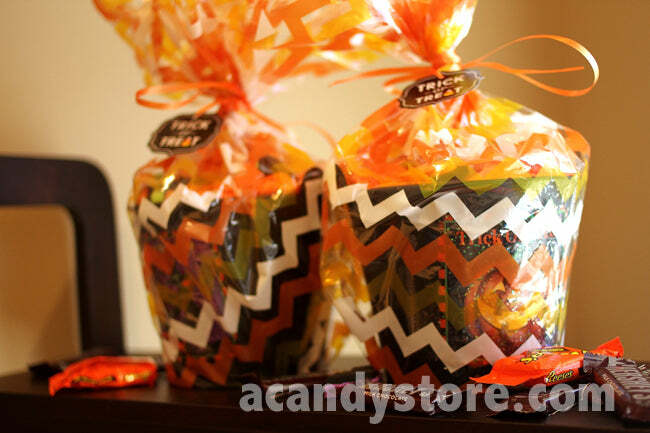 You’re going to need to whip up an awesome gift bag to help spread the benevolent Halloween spirit. 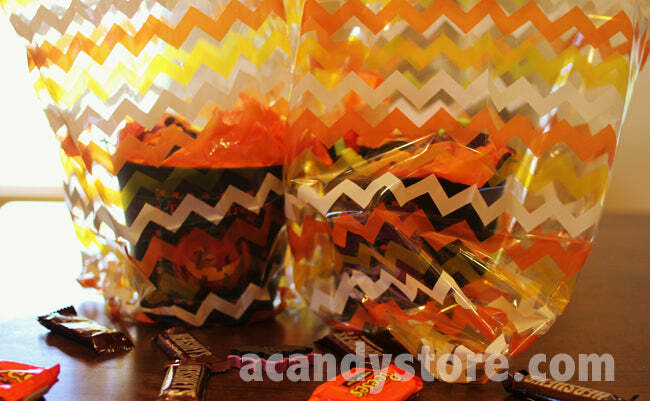 Well you’re in luck, because we just created a set of BOO bags of our own. 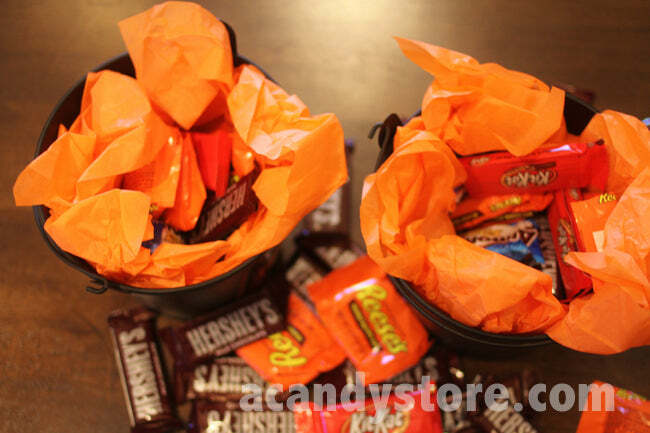 We photographed the entire process and have included a step-by-step tutorial that you can use to recreate these fun candy buckets for your neighbors. Clear off your craft table – things are about to get artsy up in here. We got all of our supplies at Hobby Lobby. If you don’t have a Hobby Lobby in your area, you should be able to pick up everything you need at a similar craft store like Michael’s or Jo-Ann Fabrics. This is pretty straightforward. 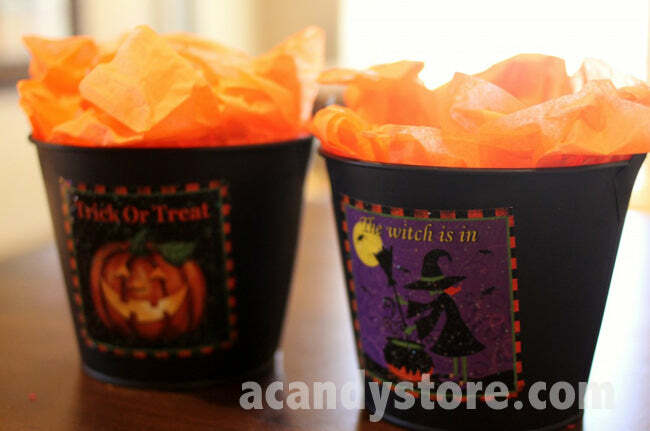 Grab two sheets of tissue paper, center them over each bucket and then stuff them down towards the bottom. Is this our favorite part? Why yes, yes it is. If the kids on your street are anything like ours, it might be a good idea to say a quiet prayer for your neighbor’s walls. The buckets are round, but the cookie bags are not. Consequently, we recommend placing each bucket in a corner of the bag and wrapping the other corner up when you tie it off, that way you won’t have little puffy wings sticking out of the sides. Twist the bags shut, wrap the ribbon around the twist several times to secure it, then string on the ribbon and tie it off in a bow. Cut off any extra ribbon with scissors. We’re not going to photograph ourselves prowling around the neighborhood, but this final step is pretty self explanatory. In case you missed the link we included above, you can print out the BOOed sheets at BeenBooed.com. Been BOOed? Let Us Know! Think you can BOO better? If you’ve been BOOed with an awesome gift bag or have a cool BOO bag blueprint of your own, post it in the comments below. We’d love to share it with our readers!